I made this for my grandson's 2nd birthday. I embossed the family names of both sets of grandparents on each wing of the house. Ethan loves tractors, so it was a down on the farm theme. 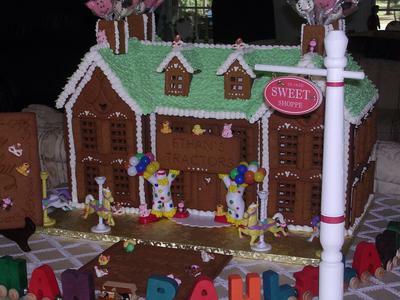 The house was decorated with candy farm animals and little piggy and cow lollipops were placed in the chimneys as party favors.